Technology can be used in various ways: for experiential purposes, to appeal to mobile users, increase convenience for shoppers, or to promote a retailer’s online presence. In 2016, Chinese ecommerce giant Alibaba opened its first Hema store in China. The premise of the supermarket is to combine elements of online and offline shopping to create the ultimate seamless experience. In-store, customers can scan QR codes on products to get more information (including the exact date food items were harvested, sourced, and delivered). Payment can also be made through the Hema app, making shopping quick and convenient. Another impressive element is Hema’s in-store dining experience, which is powered by robots. Customers can use the Hema app to organise a seat at a table, as well as order items from the store to be cooked. Robots are used to move items from shelves to the kitchen and deliver the meals when they are ready. Pretty impressive stuff. Elsewhere in China, Alibaba rival JD.com has opened its own high-tech supermarket. 7Fresh – which first opened in 2018 – includes technology elements to deliver a super convenient shopping experience. One of the main features is its smart shopping carts, which follow customers around the store (instead of having to be pushed). This means customers can keep their hands-free, making it easy to focus on looking after children and other personal tasks. The stores also include ‘magic mirrors’ that sense when an item is picked up and then display information about it. Choosing glasses can be a lengthy and exhaustive experience, with customers trying on dozens of pairs before finding the one that suits them. In 2018, Specsavers launched a new in-store service to make the process much easier. Frame Styler – which works via in-store tablets – is an imaging software tool that produces a 3D model of the customer’s face. From this, it selects the glasses that best suit the person’s face shape, gender, and age. Customers can then try on multiple styles in 3D, easily and quickly comparing pairs in seconds. A valuable bit of tech which speeds up as well as simplifies the in-store experience. In 2018, Nike opened a flagship store in New York City called the ‘Nike House of Innovation 000’. As you might expect from the name, it’s pretty impressive, including digital elements to create an immersive and highly convenient experience for shoppers. Alongside customisation studios and instant checkout points, a stand-out feature of the six-floor studio is the ‘Speed Shop’. This allows customers to reserve shoes online to try on in-store. More specifically, customers can arrive (through a dedicated entrance) to find a locker with their name on, which can then be unlocked via their smartphone. Mobile check-out is also available, meaning customers do not even need to speak to anyone (let alone stand in a queue) if they want to buy the shoes in question. The ultimate in convenience shopping. Amazon has revolutionised the online shopping experience, but the brand is now intent on taking a slice of the physical retail pie too. The Go stores use a combination of computer vision, deep learning, and sensor fusion technology to automate the payment and checkout process. This means that customers can enter the store, pick-up items, and leave without queuing or checking out, while payment is automatically made through the Amazon Go app. 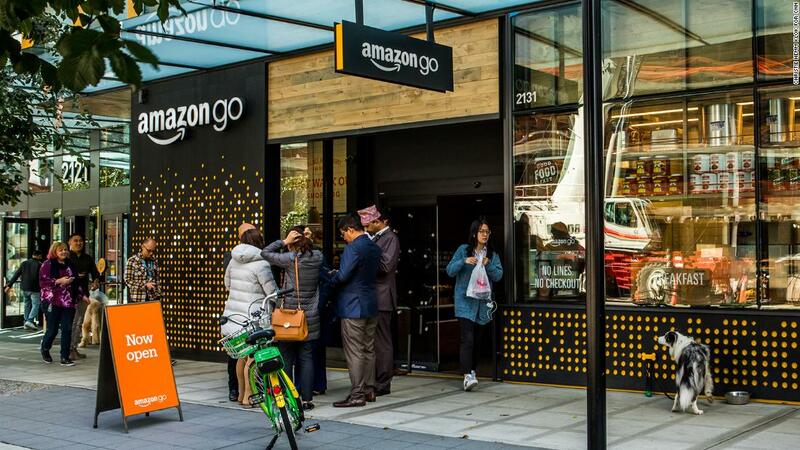 There are now nine Amazon Go stores open in the US and reported plans for thousands more worldwide by 2020.